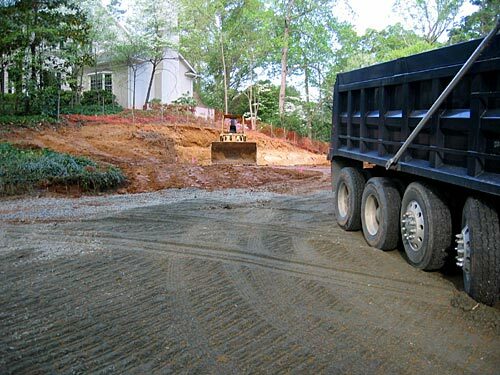 Summary: The cost of basement excavation will depend on such factors as the basement depth, basement design, basement size, soil conditions, and land terrain. Excavating for a full basement, partial basement, or a walkout basement will cost more than just excavating for a slab or a crawl space. 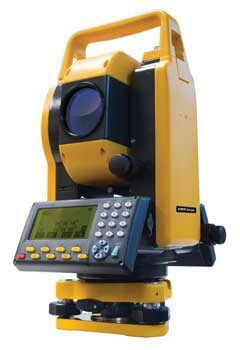 If a basement is to be dug, you or your excavation contractor must know how to use a surveying transit. A survey transit is used to know deep the basement excavation is getting while it is being dug and how level it is. The finished basement walls have to be high enough above the ground (finished grade) so that good water drainage can be obtained, so the hole cannot be too deep, or your foundation will have to be increased in height and that increases the cost of your basement foundation. 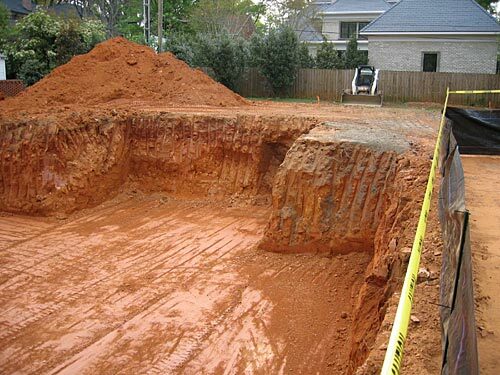 You may want to use a professional land surveyor to oversee the basement excavation to make certain it is of the proper depth, levelness, and dimensions. For simple procedures such as digging a basement, determining the depth and levelness of the excavation and the dimensions of the excavation a survey instrument called a surveying transit is needed. If you are interested in learning how to use a transit yourself, here’s a simple lesson on How to Use a Transit from New England Laser & Transit Company. Transits can be rented as well as purchased. 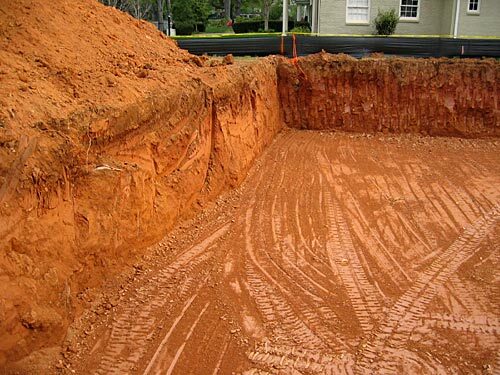 Your best source for finding an excavation contractor for digging the basement is by word of mouth from other builders, or on an actual job site. Get a total price contract for the entire job, not a “by the hour” contract. This contract should include, but not be limited to, land clearing, temporary construction driveway, and of course, excavation. It may cost a little more for a total price contract, but you will be assured of not having your first cost overrun. Some or all of the dirt removed from the basement site might be put out of the way for later backfilling and landscaping. Topsoil can be separated out to be spread later for the lawn or garden. Your contract price should also include hauling all trash, such as stumps, branches, and rocks, to a suitable landfill. I don’t advise burying trash on your lot as these stump holes, as they are called, tend to form an unsightly depression as the material in them settles or rots. Some locales ban stump holes. Of course, if the distance to a suitable landfill is prohibitively expensive and you have enough land, a stump hole may be your only choice. 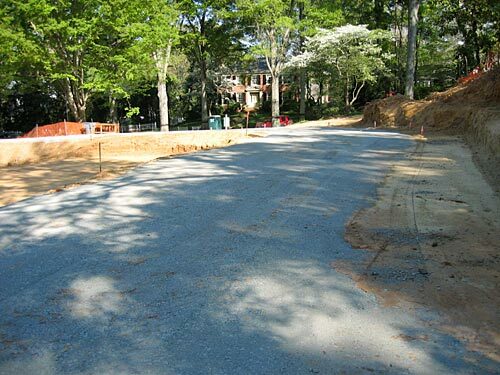 You will want to put one or more loads of stone on your temporary construction driveway so that supply trucks can drive in during wet weather. The best stone for this is unwashed crushed stone. It has all the powdery substance created in crushing the stone, and it will harden after getting wet. You also may need to put drainpipes in at the roadside if they are required by either ordinance or common sense. They allow roadside water to flow under the driveway and prevent water from washing the stone away. 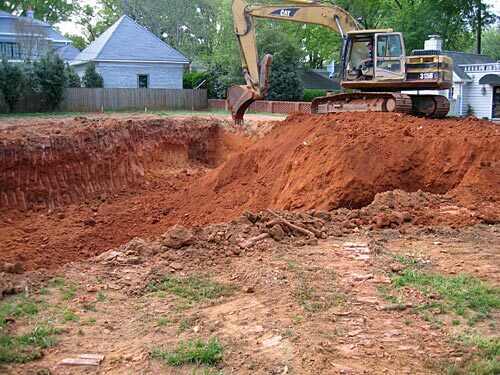 Excavation and digging the basement are just a few of the steps in building a house.